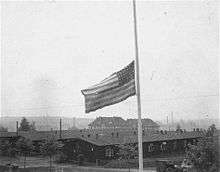 The American flag flying at half-mast in Buchenwald, Thuringia, Germany, on 19 April 1945. Half-mast or half-staff refers to a flag flying below the summit on a pole. In many countries this is seen as a symbol of respect, mourning, distress, or in some cases, a salute. The tradition of flying the flag at half-mast began in the 17th century. According to some sources, the flag is lowered to make room for an "invisible flag of death" flying above. When hoisting a flag that is to be displayed at half-mast, it should be hoisted to the finial for an instant, then lowered to half-mast. Likewise, when the flag is lowered at the end of the day, it is to be hoisted to the finial for an instant, and then lowered. The Australian White Ensign flying at half mast. In accordance with British tradition, the flag is flying one flag's width below the top of the mast. 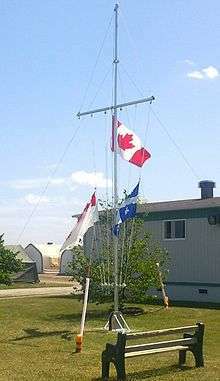 On April 2, 2008, the House of Commons voted in favour of a motion calling on the government to reinstate the former policy regarding the half-masting of the flag on federal buildings. The motion, however, was not binding and the Cabinet refused to recommend any revision in policy to the Governor General. At the same time, a federal advisory committee tabled its report on the protocol of flying the national flag at half-mast, recommending that the Peace Tower flag remain at full height on days such as the Police Officers National Memorial Day and the National Day or Remembrance and Action on Violence Against Women, stating that the flag should only be half-masted on Remembrance Day. At last report, the committee's findings had been forwarded to the House of Commons all-party heritage committee for further study. On the death of the President, Chairman of the Standing Committee of the National People's Congress, Premier, Chairman of the Central Military Commission, Chairman of the People's Political Consultative Conference, and those who have made major contributions to the People's Republic of China, or to world peace or advancement of the mankind. For example, the flag was flown at half-mast after the deaths of Mao Zedong (1976), Deng Xiaoping (1997) and Yang Shangkun (1998). When major disasters happen, such as when the flag was flown at half-mast from May 19 to May 21, 2008, the three national mourning days for the 2008 Sichuan earthquake. The French flag is flown half mast on any Day of Mourning by order of the government (for example after the Charlie Hebdo attack on 7 January 2015, the Paris attacks on 13 November 2015 and the Nice attack on 14 July 2016). Other countries have also flown the French flag at half mast because of this too. (Australia's Sydney Harbour Bridge flew the French flag at half mast because of the Paris attacks on November 13 of 2015). The HKSAR flag was flown at half-mast on August 24–26, 2010, for the fatalities of the Hong Thai Travel tourists in the 2010 Manila hostage crisis. The national flag of the PRC was also flown at half-mast on August 26 in Hong Kong. The HKSAR flag was flown at half-mast on October 4–6, 2012, for the Lamma Ferry Accident victims in which 39 people died. If the intimation of the death of any dignitary is received in the afternoon, the flag shall be flown at halfmast on the following day also at the place or places indicated above, provided the funeral has not taken place before sunrise on that day. On the day of the funeral of a dignitary mentioned above, the flag shall be flown at half-mast at the place of the funeral. In the event of a halfmast day coinciding with the Republic Day, Independence Day, Mahatma Gandhi's birthday, National Week (6 to 13 April), any other particular day of national rejoicing as may be specified by the Government of India, or, in the case of a state, on the anniversary of formation of that state, flags are not permitted to be flown at half-mast except over the building where the body of the deceased is lying until it has been removed and that flag shall be raised to the full-mast position after the body has been removed. The flag of Ireland is flown at half-mast on the death of a national or international figure, that is, former and current Presidents or Taoisigh, on all prominent government buildings equipped with a flag pole. The death of a prominent local figure can also be marked locally by the flag being flown at half-mast. 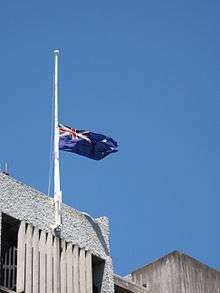 When the national flag is flown at half-mast, no other flag should be half-masted. When a balcony in Berkeley, California, collapsed, killing six Irish people, flags were flown at half mast above all state buildings. The flag of Italy was flown at half-mast after the 2013 Sardinia floods on November 22, 2013. Following the death of a former president, for example during the week following the death of Sukarno, Suharto, and Abdurrahman Wahid. During the era of President Suharto, the flying of the Indonesian flag at half-mast was administered in remembrance of the 1965 30 September Movement. However, after the fall of Suharto, this has not been enforced, mainly due to the controversies behind the movement. On other national days of mourning, such as following the 2004 Indian Ocean earthquake and tsunami in Aceh. The flag of Japan is flown at half-mast upon the death of the Emperor of Japan, other members of the Imperial Family, or a current or former Prime Minister, and also following national disasters such as the 2011 Tōhoku earthquake and tsunami. 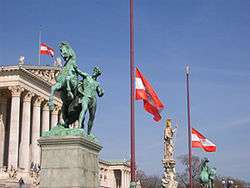 In addition to the tradition of half-mast, the national flag topped by black cloth may be flown to designate mourning. See the flag of Japan for more. 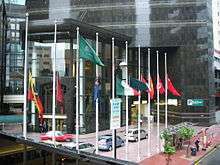 When the Prime Minister's Department ordered to flown the Malaysian flag at half-mast for some days. As a mark of respect to the passengers and crew who were on board Malaysia Airlines Flight 370 and their family members, some states had their states flag flown at half-mast. Similarly, as a mark of respect to the passengers and crew who were on board Malaysia Airlines Flight 17 and their family members, the national flag was flown at half-mast for three days. The 2015 Sabah earthquake will have a mourning day and the flag half-mast on 8 June 2015. By instruction of the Dutch government through the office of the Prime Minister in special situations, such as happened after the crash of Malaysia Airlines Flight 17 in which 193 Dutch citizens died. On October 16, anniversary of the death of the first Prime Minister, Liaquat Ali Khan (1952). Any other day notified by the Government. For example, on the death of Saudi king King Fahd bin Abdul Aziz, the flag was flown at half-mast for seven days (the flag of Saudi Arabia wasn't at half-mast because the flag contains the Shahada). Upon the Assassination of Benazir Bhutto, the flag was ordered to be flown at half-mast for three days. On the death of Syedna Mohammed Burhanuddin, spiritual leader of Dawoodi Bohra community, the flag has been ordered by Sindh Chief Minister Qaim Ali Shah, to be flown at half-mast for two days (January 17 and 18) to express solidarity with the bereaved community. In 2014, Prime Minister Nawaz Sharif announced a three-day mourning period from 16 December, including flying the flag at half-mast nationwide and at all Embassies and High Commissions of Pakistan, for the attack on Army Public School in Peshawar. As per Republic Act No. 229, flags nationwide are flown at half-mast every Rizal Day on 30 December to commemorate the death of national hero José Rizal. On June 22 as a reminder of the German invasion of the USSR in 1941. On disasters causing more than 100 killed - across all the country upon Presidential proclamation. On disasters causing more than 10 killed - in a suffering region upon proclamation of a Governor. On other tragic occasions. For example, national mourning was proclaimed and all the state flags were flown at half-mast after the Polish President's plane crash near Smolensk, Russia despite the number of casualties being slightly fewer than 100. The flag of Saudi Arabia is one of the five flags in the world that are never flown at half-mast because it shows the Shahada. The flag of Somaliland, a self-declared state internationally recognized as part of Somalia, also displays the Shahada. The flags of Iran and Iraq bear the Takbir 22 times and once, respectively. The flag of Afghanistan displays the Takbir beneath the Shahada on the top. Since all five bear the concept of oneness of God, the flag is never lowered to half-mast even as a sign of mourning. On the death of a former Deputy Prime Minister, Toh Chin Chye, who was cremated on 7 February 2012. On the death of the first Prime Minister, Lee Kuan Yew, who died on 23 March 2015. On the death of 7 pupils, 1 teacher and a guide from Tanjong Katong Primary School due to 2015 Sabah earthquake. On the death of the sixth President of Singapore, S. R. Nathan, who died on 22 August, 2016. The flag of the Republic of China is flown at half-mast on February 28 to mark the anniversary of the February 28 Incident. On 5 August 2014, Taiwan flew their flag in half-mast for three days to commemorate the victims of the Kaohsiung gas explosions and TransAsia Airways Flight 222 crash. The flag of Thailand was flown at half-mast for 15 days to mourn for the victims of 2004 Indian Ocean earthquake and tsunami. The flag of Thailand was flown at half-mast from January 2 to January 15, 2008 on the death of Princess Galyani Vadhana, the Princess of Naradhiwas. The flag of Turkey is flown at half-mast throughout Turkey every 10 November, between 09:05 and the sunset, in memory of Mustafa Kemal Atatürk, who died on November 10, 1938 at five past nine in the morning. At other times, the government may issue an order for the national flag to be flown at half-mast upon the death of principal figures of the Turkish political life as a mark of respect to their memory (such as Turgut Özal). When such an order is issued, all government buildings, offices, public schools and military bases are to fly their flags at half-mast. To show the sympathy of Turkish people to a foreign leader, flags are also flown at half-mast by governmental order (such as after the deaths of Yasser Arafat or Pope John Paul II). 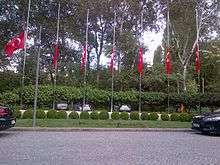 The flag at the Grand National Assembly in Ankara is never lowered to half-mast, regardless of the occasion. The flag at Anıtkabir, the mausoleum of Mustafa Kemal Atatürk, the founder of Turkey, is only lowered to half-mast on November 10. At those times when the flag is to be flown at half-mast, it must first be raised to full height, then lowered to half-mast. 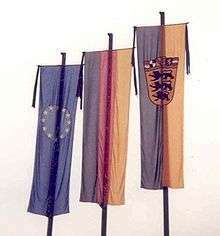 If a flag flying day coincides with a half-mast flag flying day (including the death of a royal), the flag is flown at full-mast unless a specific command is received from the Sovereign. At the United Nations offices in New York and Geneva, the flag of the United Nations flies at half-mast on the day after the death of a Head of State or a Head of Government of a member state, but generally not during the funeral. Other occasions are at the Secretary-General's discretion. Other offices may follow local practice. To honor the memory of Dag Hammarskjöld the UN issued postage stamps showing its flag at half-mast. In the United States, the correct term for non-nautical use is "half-staff." While the term "half-mast" is commonly used in place of half-staff, U.S. law and military tradition indicate that "half-mast" is reserved to usage aboard a ship, where flags are typically flown from masts, and at naval ships ashore. Elsewhere ashore, flags are flown at "half-staff." In addition, flags are lowered to half-staff, not raised. Governors of the several U.S. states or territories are authorized by federal law to order all U.S. and state flags in their jurisdiction flown at half-staff as a mark of respect for a former or current state official who has died, or for a member of the armed forces who has died in active duty. The governor's authority to issue the order is more restricted than the president's, and does not include discretion to issue the order for state residents who do not meet the criteria stated. Since a governor's executive order affects only his or her state, not the entire country, these orders are distinguished from presidential proclamations. For thirty days after the death of a current or former president or president-elect, as occurred after the death of President Reagan and the death of President Ford. On October 16, 2001, President George W. Bush approved legislation requiring the United States flag to be lowered to half-staff on all Federal buildings to memorialize fallen firefighters. Pub.L. 107–51 requires this action to occur annually in conjunction with observance of the National Fallen Firefighters Memorial Service. The date of the National Fallen Firefighters Memorial Service is traditionally the first Sunday in October. It is held at the National Fallen Firefighters Memorial in Emmitsburg, MD. The flag of Zimbabwe is flown at half-mast at the conferment of National Hero Status to the deceased. As a first-generation republic, adjudication over such a status is currently done by the politburo of the ZANU–PF. ↑ "Flags at half mast". ↑ Trex, Ethan (20 December 2012). "Why are flags flown at half-staff in times of mourning?". The Week. Retrieved 22 June 2015. ↑ Bartram, G., A Guide to Flag Protocol in the United Kingdom, an extract from the book British Flags and Emblems", The Flag Institute. ↑ FitzSimons, Peter. "There is a way Phillip Hughes' proud legacy can live on". Retrieved 28 November 2014. ↑ Knox, Malcolm (28 November 2014). "Phillip Hughes a cut above the rest". The Sydney Morning Herald. Retrieved 28 November 2014. ↑ "Phillip Hughes: Tributes flow from international community as flags fly at half-mast at Lord's" (ABC News). 28 November 2014. Retrieved 1 December 2014. ↑ "MH17: Australian flags to be flown at half-mast as nation mourns victims". 19 July 2014. ↑ Hasham, Nicole (16 December 2014). "Sydney siege ends: flags to fly at half mast and floral tributes at Martin Place". The Sydney Morning Herald. Retrieved 17 December 2014. ↑ Remeikis, Amy (16 December 2014). "Flags fly at half mast in Queensland to honour Sydney siege victims". The Sydney Morning Herald. Retrieved 17 December 2014. ↑ "Rules for Half-masting the National Flag of Canada". Department of Canadian Heritage. Retrieved 2008-03-31. ↑ "Flags at Half Mast Everywhere and Amusement Places Closed.". The New York Times. 1901-01-23. Retrieved 2008-03-31. 1 2 "Conservatives decide not to lower the Canadian flag to fly the flag at half-mast every time a Canadian soldier is killed". CBC. 2006-04-01. Archived from the original on 2011-01-20. Retrieved 2008-03-31. ↑ "Peace Tower flag will not be lowered for military deaths". CBC. 2006-04-24. Archived from the original on 2008-06-06. Retrieved 2008-03-25. ↑ "Sask. flags at half-mast for fallen soldier". CBC. 2006-08-09. Archived from the original on 2009-05-08. Retrieved 2008-03-25. ↑ Greenaway, Norma (2008-04-02). "Conservatives lose flag vote". CanWest Global Communications. Retrieved 2008-04-13. ↑ "5-day state mourning in India as a mark of respect to Nelson Mandela - The Times of India". The Times Of India. ↑ "Holidays — Holocaust Remembrance Day". Retrieved 2010-10-23. ↑ "Memorial Day Law for the Fallen of Israel's Wars (unofficial translation)". Retrieved 2010-10-23. ↑ "It falls under their prerogative, says government official - Nation - The Star Online". ↑ migration (18 July 2014). "Malaysia Airlines MH17 crash: Flags to fly at half-mast over next three days, says Najib". ↑ "Flags, Symbols and their uses". 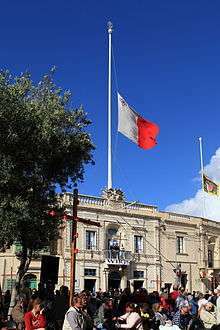 Government of Malta. Retrieved 4 April 2015. ↑ "Flags at half mast". Times of Malta. 1 January 2005. Retrieved 4 April 2015. ↑ Koninkrijksrelaties, Ministerie van Binnenlandse Zaken en. "Ministerie van Binnenlandse Zaken en Koninkrijksrelaties". 1 2 "Flying the New Zealand flag". ↑ "Sir Edmund Hillary dies". 12 January 2008. Retrieved 2008-01-16. ↑ "Half-masting of New Zealand flag". Archived from the original on 2009-08-07. Retrieved 2008-01-16. ↑ "At least 141 dead in Taliban school attack in PeshawarARY NEWS". ↑ "Republic Act No. 8491". Archived from the original on 2007-12-05. Retrieved 2009-06-08. (archived from the original on 2007-12-05). ↑ "Government Notice: Instructions regarding the flying of the national flag of South Africa". Government of South Africa. 8 June 2001. Retrieved 16 December 2013. ↑ "Nelson Mandela dead: Full address to the nation by President Jacob Zuma". The Independent. London. 5 December 2013. Retrieved 15 December 2013. ↑ "Flags to fly at half mast for a week". The Mercury. 20 August 2012. Retrieved 16 December 2013. 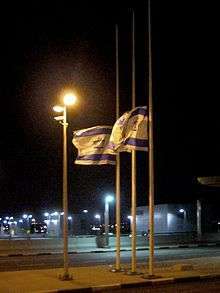 ↑ "Flags flying at half-mast to mourn explosions, air crash". The China Post. 6 August 2014. Retrieved 28 November 2014. ↑ Pierce, Andrew (August 18, 2007). "Royal Family learnt lesson over Princess Diana". The Daily Telegraph. London. Retrieved 2012-03-18. 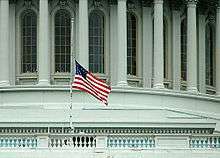 ↑ "Does a Flag Fly at Half-Staff or Half-Mast? USA Flag Site". ↑ "Sept. 8 Confused Words flashcards - Quizlet". ↑ "Nixon's Proclamation 3948 establishing the expectation that the flag will be raised to half-mast upon the death of certain designated officials". presidency.ucsb.edu. Retrieved 2012-12-20. ↑ "Honoring the Victims of the Incidents on Tuesday, September 11, 2001" (Press release). White House. September 12, 2001. Retrieved 2008-01-16. ↑ "Flying the American Flag at Half Staff" (PDF). U.S. Department of Veterans Affairs. Retrieved 12 June 2016. ↑ "National Pearl Harbor Remembrance Day, 2007" (Press release). White House. December 4, 2007. Retrieved 2008-01-16. ↑ "Patriot Day, 2007" (Press release). White House. September 4, 2007. Retrieved 2008-01-16. ↑ "National Fallen Firefighters Memorial Service". The Library of Congress. October 16, 2001. Retrieved 2010-05-06. ↑ "National Fallen Firefighters Monument". National Fallen Firefighters Foundation. October 1, 1981. Retrieved 2010-05-06. ↑ "Code Modifications for Half-Staff at a Federal Facility". 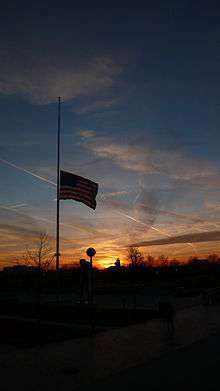 "When to fly the flag at half mast", gettysburgflag.com. Retrieved 2009-01-04. ↑ giaoduc.net.vn (6 October 2013). "Cách treo cờ rủ Lễ tang Đại Tướng Võ Nguyên Giáp".